Allows for maintaining the system objects. 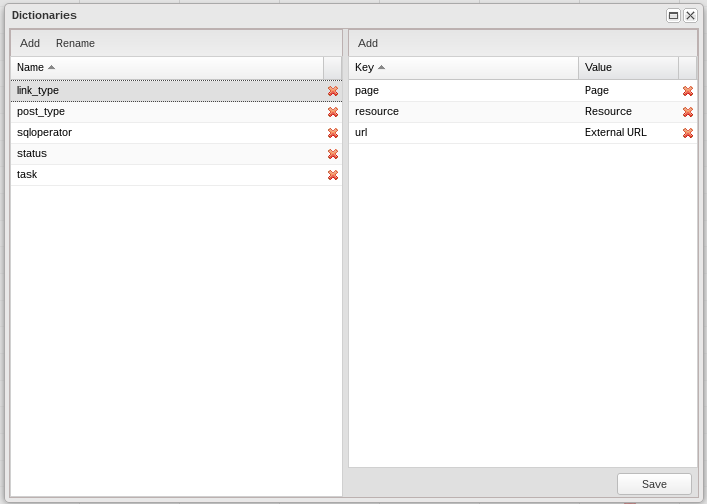 ORM objects validate input data as well as the relations on their own. Is System - defines whether the object is a system object. The object may be edited by clicking twice on the corresponding line in the table of objects or by clicking the icon, while the icon will delete the object. Please keep in mind that deleting an object will also delete the related table from the database. The button marked by the icon in every line is used to rebuild the structure of the database table if it is not valid. Besides, there is the “Build All” button in the upper menu. To backup the ORM data, it is enough just to click the button. The copies will be zip archived by default, however, if the necessary extension has not been set up on your server, the copy will be saved into a folder the regular way. Copies of both the types can be restored. The backup copy includes system objects, dictionaries, sql dump. To restore the previously saved system version, click the button. A window listing the available copies will show up. Upon selecting the necessary one and clicking 'Restore', you will be able to specify whether to restore the saved sql database dump or just to copy the system files. The mechanism creating backups is temporarily disabled in o.9.1 and 0.9.2 releases due to changes in ORM architecture (external tables support added). The feature will be restored in 0.9.3 - 0.9.4 releases. Please pay attention that the type of storage may limit the number of allowed field types and indexes. Field used as title for link – a field used as a title when displaying links to the object. Use DB Table Prefix – a checkbox used to allow a prefix in table names. 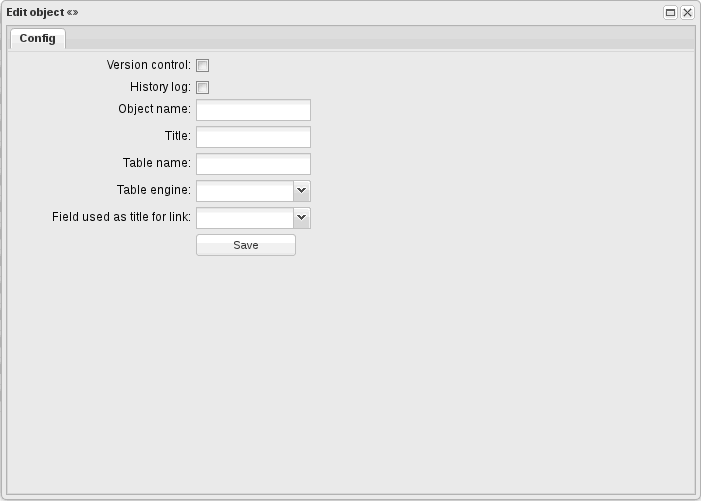 It affects the table name input and allows using various prefixes for different application setups. It also boosts the application security. If the checkbox is not ticked, the table name is to be entered the following way: prefix_tablename. Otherwise, it is just tablename. 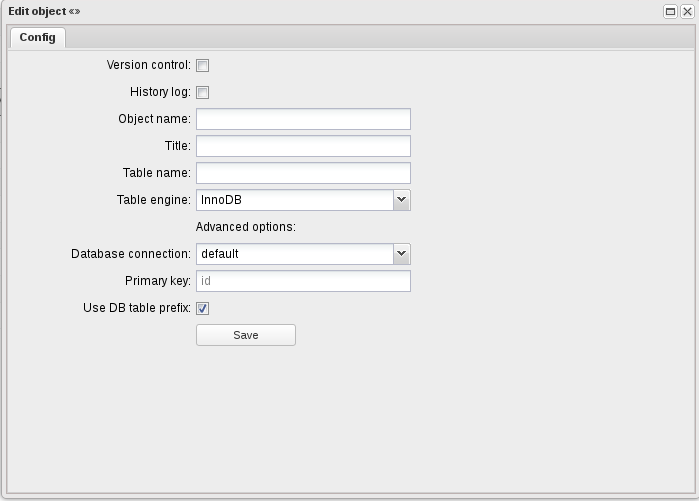 Lock Table Structure – a checkbox preventing ORM from changing the database structure, but allowing to read and write data. 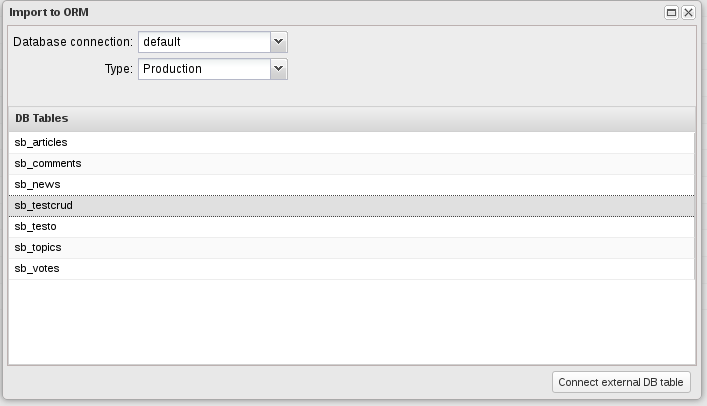 Upon successfully saving the object, there become available additional tabs such as Fields and Indexes. The Indexes tab shows information on the existing indexes. User indexes may be edited by clicking the icon and may be removed by clicking the icon. Here, we also see system indexes, which have the sign and can't be edited or removed. The number of system fields may vary depending on the object configuration. Fulltext – a fulltext index. The 'Fields' tab shows the information on the existing fields. User fields may be edited by clicking the button or removed by pressing . 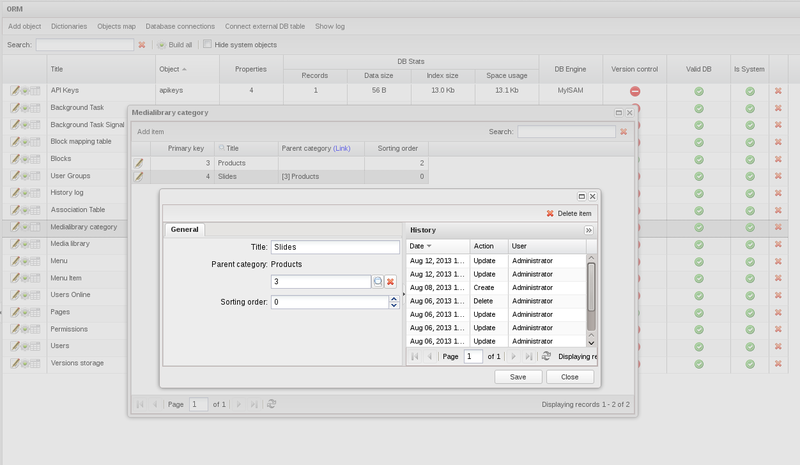 Here, we can also see system fields, which have the by the side and can't be edited or removed. The number of system fields may vary depending on the object configuration. Each object contains 'ID' system field - unsigned integer autoincrement. published_version – a published document version. The 'Type' field displays the type of the object field and may contain regular types (such as int, char and others) as well as link (specifies the object, which the field links to) and dictionary link (specifies the dictionary, which the field links to). Besides, clicking the dictionary link will open the window for editing the dictionary, which the field links to. 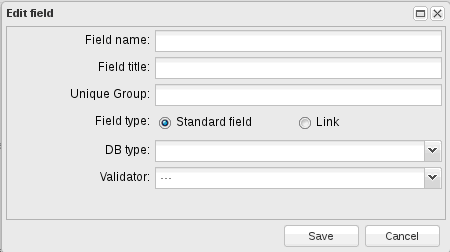 Unique Group – the name of a group of unique fields (a unique ORM index may serve for one as well as for several fields, just specify one group if necessary). - Link – a link, which might be a link to an object, a multilink to an object, a link to the dictionary definition (a certain list, which is defined also in the ORM chapter), whereas links may also be characterized as 'required'. A dictionary may be added by clicking the 'Add' button, which will open a window for entering the dictionary name. The dictionary may be removed by clicking the icon. Please keep in mind when removing a dictionary that the existing data is not being validated over again, which may consequently lead to a situating when a record is linking to a dictionary, which no longer exists. To rename a dictionary, select one from the list and click the 'Rename' button. To view and edit the dictionary, select the one you need and wait for its parameters to show up in the right-hand part of the window. A single click on the cell will enable you to edit the value. To add another line, click 'Add' in the right-hand side of the window. A new line will show up enabling you to modify it as per the above instructions. A dictionary record may be removed by clicking . Unlike editing, removing dictionary records comes into action immediately after the confirmation has been received. Please note that the record keys are to be unique. The updated cells have a red triangle in the left-hand top corner. The modifications are saved only upon clicking Save. If this has not been done and another dictionary is selected or the window is closed, the updates will get lost. 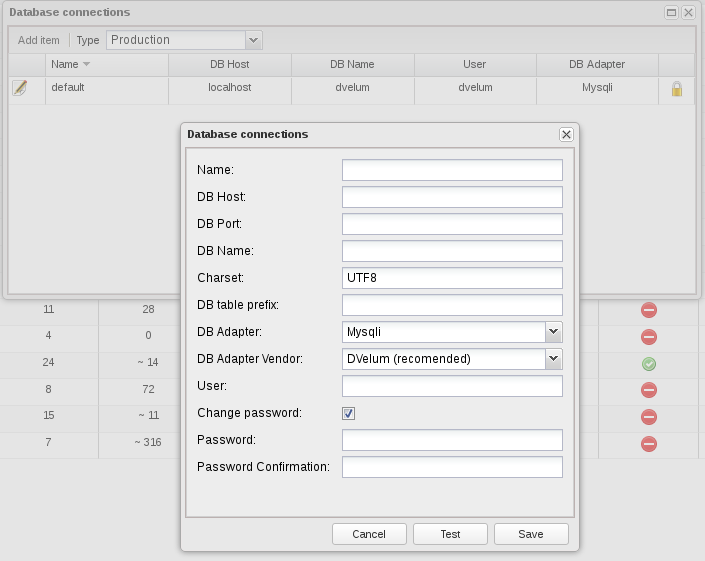 The interface allows to set up external database connections. Please note that a separate connection should be set up for each system operating mode. Thus, connections in various modes have a common name, but different settings. 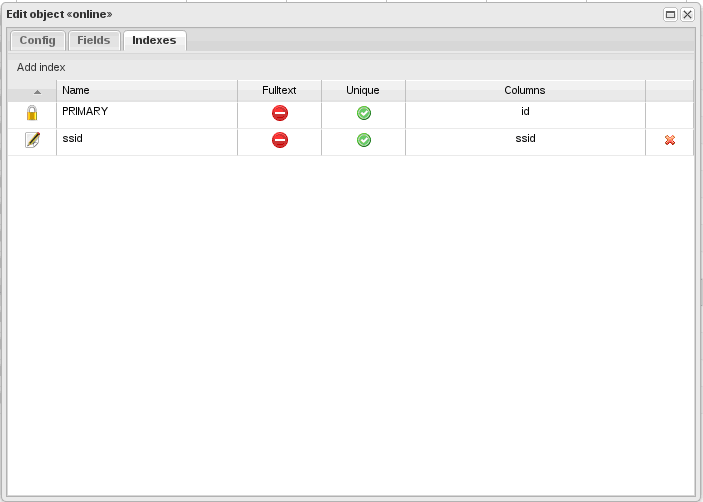 ORM management interface allows to import objects from external databases. 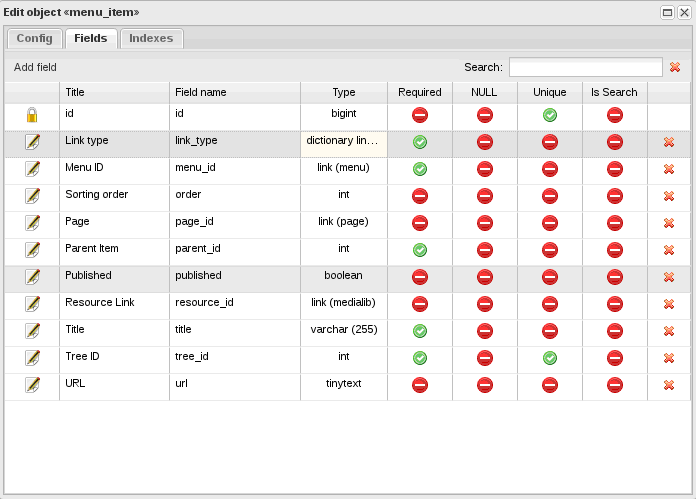 Herewith, a file describing the object structure (meta data) is the only thing created on the server side, while the data is provided by the database specified in the connection settings. Thus, external databases can be easily connected. 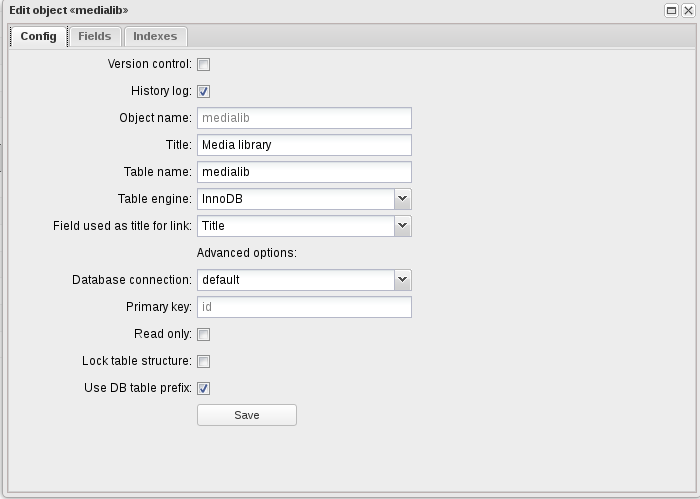 To avoid changes in an external database, such ORM object settings as readonly / lock table structure should be used.